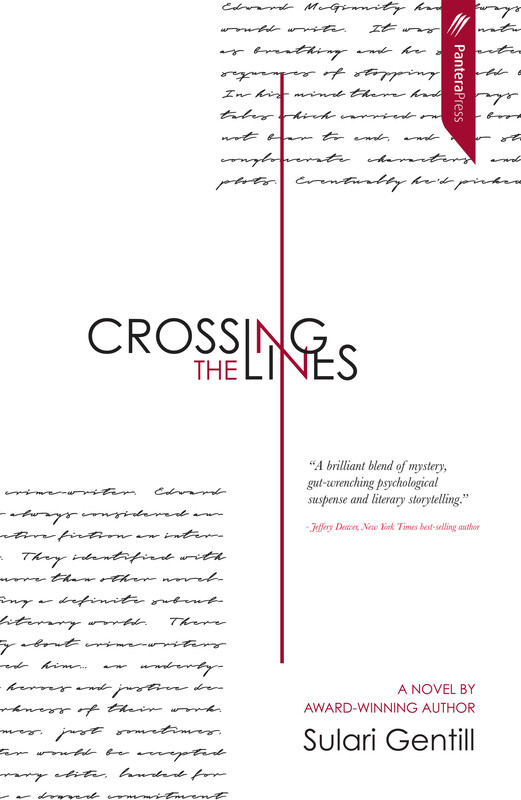 Crossing the Lines is a book that smiles and offers cake while it thinks. Sulari Gentill delivers ideas and narrative entertainment, and it’s a bonus that her novel is also sub-acidly satirical. When a friend irritated by protagonist Madeleine’s unavailability laughs in response to her apologetic explanation that she is completely herself only when writing, “scorn was cut into the mirth like some bitter essence folded into whipped cream”. Events are set in motion when an arts critic and former book editor named Vogel is found dead in the stairwell of an Australian city gallery, his head “peculiarly offset from his neck”. An amusing but consciously flimsy whodunit results, while in parallel a tragicomedy of thwarted creativity in a rural domestic environment evolves. Correspondences abound. Madeleine, heartbeat of the domestic story, is a crime writer who understands herself to be imagining the protagonist of the whodunit into being and improvising that plot. The whodunit’s protagonist, litterateur Edward, believes he has discovered the down-market writer character Madeleine and is recording and influencing her fortunes. Gradually the two protagonists advance from observing each other across the notional lines separating them to transitioning into each other’s worlds, at first conversing and then making love. So far so ingenious. However, Gentill also delivers a meta-narrative that is both a col­loquium about perennial puzzles such as the ­nature of reality and an illustrative examination of why and how writers construct characters and fictions. Overall, the book may also be read as a self-interrogation, with a mid-career author who has mastered her chosen field (crime fiction set in the early 20th century) pondering whether she cares to aspire to write in high-culture mode. Elaborating the metaphor of Genesis-like creation out of formlessness, it also asks whether greater satisfactions might be found in freely mixing genres to make new hybrids. The concerns addressed in Crossing the Lines reminded me of some of the novels published in those so-called transitional decades in English writing, the 1880s to the 1930s. Like John Galsworthy, Arnold Bennett and others, Gentill is wary of fashionable modernity yet wants to take account of sociopolitical change. She acknowledges the worth of the material and is uneasy around sentimentality and sensationalism. Nicola Humble has defined middle­brow fiction as straddling the divide between lightweight romances and thrillers, and philosophically and formally challenging texts. Crossing the Lines can be called middlebrow in an appreciative sense. The existence of a crime fiction genre distinct from literary prose is firmly posited in Gentill’s protagonists’ binary-minded discussions. As a self-regarding literary author, ­urbane Edward regards crime writers as a naive lot who believe in justice and retribution, are doggedly committed to plot, action and pace, want the purity of story without the shackles of secondary meaning, and can be accepted into the aesthetic elite only if they are exceptional stylists. His bourgeois Madeleine suits the take­aways-and-pyjamas cosiness of the cottage she shares with her GP husband. As a part-time corporate lawyer and professional author, Gentill’s playfully self-referential Madeleine does not care to be under­estimated. She puts Edward in his place as her fantasy creature, a nostalgic figure who would be more at home in the 1930s, justifying her choices with a mix of commercial nous and familiar criticisms of literary writing (nothing happens, it’s dull, it’s incomprehensible, it’s worthy navel-gazing). Comprehensibility is so very genre, Edward ripostes, the debate proceeding like the banter of a Beatrice and Benedict as the two protagonists grow fonder of each other. Conceding the impacts family losses have had on him, Edward asserts Madeleine fails to examine the causes of grief, her miscarriages being the most pertinent example. “Little sadnesses are not a plot,” she replies. Edward’s self-importance is diminished by the absence of samples of his published writing and names of authors he esteems. Having scarcely bothered to read any of “his” Madeleine’s tales, he is uncertain how to reproduce her voice. From the beginning, Edward acknowledges his grievance against Vogel, who “defiled” and “murdered” his first manuscript, titled Sentience, when charged with editing it. In Madeleine’s plot, this resentment is reason enough for the police to suspect Edward of Vogel’s murder. Her Edward is a hero falsely accused and obliged to turn amateur detective. Madeleine’s arguments are undercut by her dissatisfaction, derived from the limits she has placed on her writing practice. Perhaps trying to challenge herself, or perhaps self-subverting, she countenances foolhardy risks. Taking literally the advice of Raymond Chandler, another writer frustrated by the constraints of plotting, she has three unknown men burst into Edward’s house, even though she has no idea who would want to attack Edward or why. Can she make lemonade from this lemon? “Have you worked out who attacked me?” the affronted Edward asks after arriving home from hospital. “The demons of our own creation are always more dangerous than the ones who walk through the door,” he reproves. Creatives’ detachment and self-absorption can look like obsession verging on mental illness. Gentill has her protagonist-authors not only affirm the need for immersive and prolonged thinking and writing but live the psychological problems that grow as identification with subject matter intensifies. With mutual desire and possessiveness increasing, Edward sees he is “courting disaster” by continuing to cross the line and Madeleine admits to “daring madness” to take her. An author friend of Madeleine warns her against letting herself be consumed by her constructs, and developments in the parallel storylines show writers’ vulnerability to mistreatment and manipulation. In a move that could be gaslighting, Madeleine’s husband takes to telling her she is depressed and infertile. He persuades her to consult a psychiatrist, who is then complicit in manoeuvring her toward confinement in a private hospital. Simultaneously, Edward experiences erosion of trust and the likelihood he will be jailed. To be locked up and prevented from writing, yet possessed of sufficient sentience to be able to forever muse on one’s beloved fictional creation: what strange hell would that be?